A shopping plaza where the city and community partners have been trying to open a supermarket for more than a decade was sold in the fraud case against the former Tribune Tower owner. A federal court sold the Jack London Gateway plaza on Feb. 27. West Oakland has long been classified as a food desert because of the lack of grocery stores in the area. And the neighborhood may remain that way for years to come, because a shopping plaza where the city and community partners have been trying to open a supermarket for more than decade was recently sold in the fraud case involving the former Tribune Tower owner. 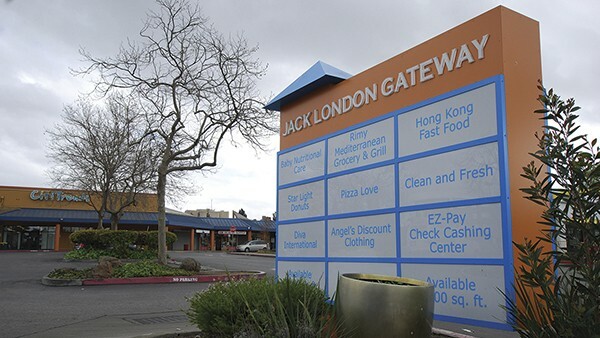 The sale of the Jack London Gateway shopping plaza at 800 Market St. was approved by U.S. District Court Judge Richard Seeborg on Feb. 27 as part of ongoing fraud litigation brought by the U.S. Securities and Exchange Commission against Tom Henderson, who used to own the shopping plaza, the Tribune Tower, and several other Oakland properties. A court receiver sold the shopping plaza to a Los Angeles property manager over the strong objections of the nonprofit organization that has owned a stake in the property since 2003 and has been desperately trying to open a grocery store there. The SEC sued Henderson for fraud over a year ago. The agency accuses him of running a massive scheme in which he exploited the federal EB-5 visa program, which allows foreign investors to obtain green cards for investing in U.S. businesses that create jobs. Henderson proposed myriad businesses in Oakland to meet the job-creation goals for the hundreds of EB-5 investments he solicited, including promising to open three grocery stores in West Oakland, which has been classified as a food desert by the U.S. Department of Agriculture. To that end, with the help of Oakland City Councilmember Lynette Gibson McElhaney, he joined with a nonprofit community group called the West Oakland Marketplace Advancement Company, or WOMAC, eventually buying out WOMAC's partners in the shopping plaza. Henderson then owned 75 percent of the plaza, and when the SEC sued him, it went under court control. Before the sale, the court-appointed receiver reached an agreement with the city stipulating that any buyer would agree to open a grocery store at the site within three years. The property, which includes the 59,000-square-foot retail center, a McDonald's restaurant, and a 59,000-square-foot condominium complex to the north, has been without a grocery store since 2007. Several businesses lease space in the run-down plaza, including a Chinese restaurant, a doughnut shop, a pizzeria, and a check cashing store. The property was sold to Rishi Thakkar and Kevin Louie. Thakkar, of RVT Capital, is based in Los Angeles and manages several other real estate investment firms, according to state records. He did not respond to interview requests. The shopping center, which is across the street from the Acorn housing projects, was built in 1983 by the nonprofit Acorn Community Improvement Association and financed by a federal grant and a loan from the now-defunct Oakland Redevelopment Agency. The redevelopment agency eventually took control of the property and sold it in 1989 to a private investor, Alex Hahn. But Hahn closed the grocery store in 1996 due to low sales. Eventually, the redevelopment agency purchased the plaza back. In the late '90s, the redevelopment agency sold the shopping center to a new coalition: the nonprofit East Bay Local Asian Development Corporation, or EBALDC; commercial developer Portfolio Properties Investors, or PPI; and community partners the Westside Economic Development Corporation. In 1999, the new owners opened a Gateway Foods location there. In 2003, WOMAC, which is affiliated with Acorn, replaced the Westside Economic Development Corporation as the community partners. The Gateway Foods store closed in 2004 and a Korean grocer moved in. But that store suddenly shuttered in 2007 amid reports of embezzlement. The plaza hasn't had a grocery store since. After Henderson purchased the Tribune Tower in November 2011, he quickly became hugely influential in Oakland, spending time with local politicians and receiving adoring profiles in local newspapers for his promises to bring hundreds of jobs to Oakland. By the end of 2013, he had made public promises to open three grocery stores in West Oakland and reached out to Gibson McElhaney about the idea, who arranged discussions with the owners of the Jack London Gateway site. According to emails obtained by the Express through a public records request, Gibson McElhaney had once hoped to facilitate a partnership to bring Henderson into the grocery store project by May 2013. The plaza's owners had been considering leasing space to a Dollar Tree store and the city council was set to decide whether to lift a deed restriction that obligated a grocery store in the space, but Gibson McElhaney delayed the decision. By December 2013, Gibson McElhaney had arranged meetings with Henderson, city staff, and representatives of EBALDC and PPI, and Henderson had indicated that he intended to purchase the shopping center. But he seemed to be stalling. On Jan. 7, 2014, Lorie Alemania from PPI wrote to Gibson McElhaney, "We did not receive the offer from Tom Henderson that he indicated we would have before the end of the year." At the time, Henderson was involved in a conflict over a logistics business he was working to open at a West Oakland warehouse. In April, after Henderson won an appeal, Gibson McElhaney sent him a message of congratulations. "It will be good to move this and your other projects along to foster a healthy community and economy," she wrote. Henderson responded the same day, complaining about the difficulties of doing business in Oakland. "A few people can tie up a project without any knowledge," he wrote. "Grocery store and the JL Gateway project is now full speed ahead as of this morning." But less than two weeks later, Henderson wrote back to Gibson McElhaney alerting her that he was backing out of a meeting organized by the Block by Block Organizing Network to discuss the grocery store project, saying that PPI and EBALDC had not responded to a letter of intent from WOMAC on his behalf. They "need to be pushed," he wrote. Then in June of that year, after more delays, Henderson dispatched an angry email to Gibson McElhaney. "We are ready to buy the property. We have created more than 400 jobs to date in Oakland," he wrote. "Are you delaying this project with your list of hurdles that no one has ever seen to date?" In December 2014, Henderson finally reached an agreement to purchase EBALDC and PPI's shares of the shopping center and share it with WOMAC. He obtained a $6.9 million loan for the purchase and borrowed $3.7 million from WOMAC, which he promised he would begin paying back in February 2015, according to court filings. But Henderson never started payments, and in September 2015, WOMAC sued, saying that not only was he not paying back the loan, but he had taken no action to rehabilitate the property. In November 2015, despite the litigation surrounding the project, Henderson started soliciting investors for the grocery store business. But he only signed four investors onto the project for a total of $2.2 million, all of which he raised after WOMAC filed its lawsuit. By then, he was already being sued by another business partner in his call center businesses and had been sued by a third partner, restaurateur Chris Pastena, and reached a settlement. After the SEC sued Henderson in January 2017, WOMAC's lawsuit was eventually placed on hold and the shopping plaza went in receivership, along with most of Henderson's properties. On Oct. 5, Judge Seeborg approved court-appointed receiver Susan Uecker's request to list the property for sale; she had sold some of Henderson's other properties, like the Tribune Tower, to pay back investors. In court filings, WOMAC objected to the sale, pointing out that the SEC alleges that only $150,000 of EB-5 investor funds had been used toward the purchase price of the shopping plaza — unlike other properties Henderson had acquired using millions in investors' funds. As WOMAC had feared all along, Henderson's fraudulent conduct has wrenched the shopping plaza from local control, and only time will tell if, after more than a decade, a grocery store will ever open at the Jack London Gateway. Henderson, meanwhile, has reached a tentative settlement with the SEC.